Kauai is a magical place. It fills us with wonder — the sea, the plants, the creatures! There were 14 of us. painted our hearts out — all on the tropical island of Kauai. I have NO IDEA what this is, but found it floating on the beach. We listened to poetry by Sue and Rosemary. decorated with last year’s Hawaiian limpets! …where it rained! I’m ducking for cover. But the sun blessed us most of the time this year. …always on the lookout for ripe fruit — or a photo op! A special moment, finding a favorite artist showing in a local gallery. We visited the Kilauea lighthouse. Laura added immensely to every facet. Her baking was awesome! Sun, Jan 24 – Fri, Feb 5, 2016. A slideshow of our KAUAI artwork is coming soon! Distracted with work on a marbling video and with teaching in Kauai, I haven’t been blogging as much as I would have liked. The upside is that I have had an opportunity to work on several pieces I’ve been wanting to marble plus working on a few new paintings. Stay tuned for more examples. 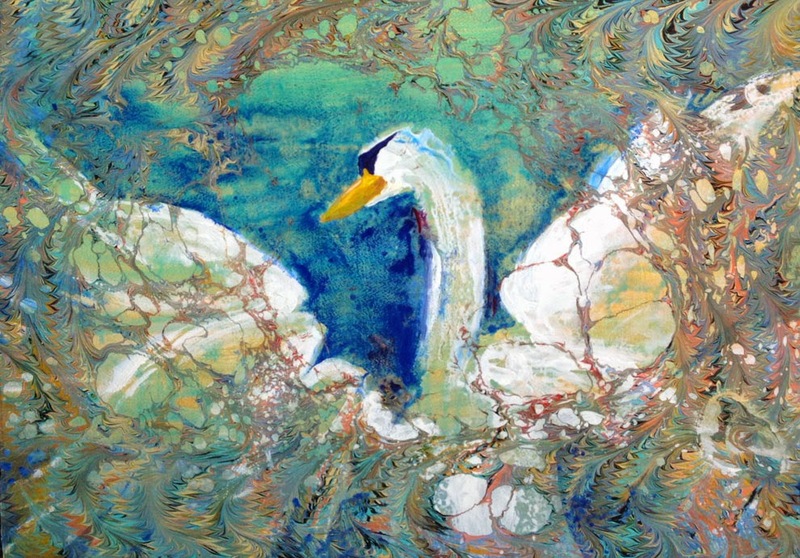 This is the marbled painting you saw in my last post. I don’t love it at this stage, but there’s way too much fun happening here to give up! Below is the piece again, after painting over it with gouache and watercolor! Notice how the shape of the head and beak have changed and how the body is now defined. 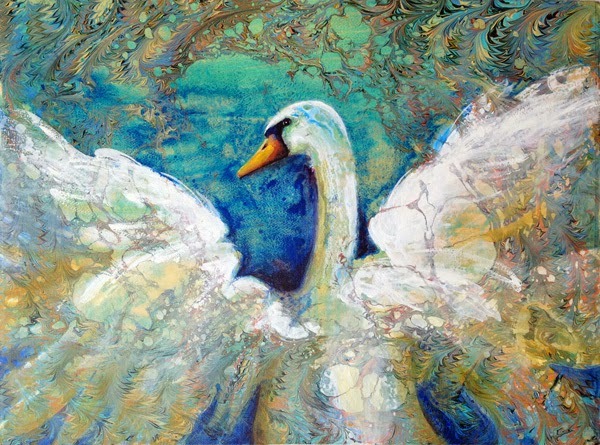 Adding white feathers over the marbling, along with a bit of darkening of the background near the shoulders creates that definition while the underlying marbled pattern lends cohesiveness and complexity to the piece. http://rene-art.com/wp-content/uploads/2015/02/swanWEB.jpg 223 320 Rene Eisenbart http://rene-art.com/wp-content/uploads/2016/03/RAE-logo4.png Rene Eisenbart2015-02-14 02:24:002016-03-17 20:18:29DUCKLING into a SWAN?